Earlier, it was murres and whales that had been turning up dead in large numbers on Alaska beaches or in Alaska waters. Now it is puffins, bright-beaked birds that are icons of Alaska's marine communities. "In 10 years of standard beach surveys, we've only found, at most, three tufted puffins. There's a very big difference there," said Parrish, who is executive director of the Coastal Observation and Seabird Survey Team program — COASST— based at the University of Washington. 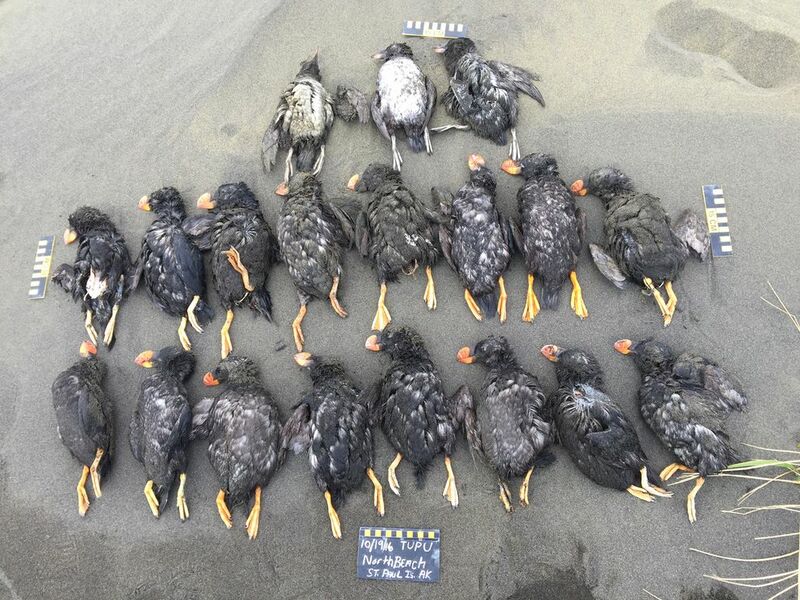 The puffins' carcasses are mostly intact — showing no evidence of predation — but they are emaciated, indicating severe food shortages in their habitat, Parrish said. Parrish said she believes the die-off is linked to the much higher-than-normal temperatures in that part of the Bering Sea. Such conditions trigger a pattern that is being replicated in St. Paul, she said — more post-breeding birds hugging the shoreline and coming to shore, large beaching of birds and death by starvation. Unusual warmth has been documented this fall on and around St. Paul Island. Sea-surface temperatures in the Bering Sea have soared well above average since August, according to the National Oceanic and Atmospheric Administration. Air temperatures have also been much higher than normal. While experts say that any particular event can't be tied to climate change because of the normal variability of weather, overall global warming, blamed in part on humans' use of fossil fuels, is linked to a rise in sea-surface temperatures. President Barack Obama has made addressing climate change a central focus of his administration, but President-elect Donald Trump has dismissed global warming as a Chinese conspiracy and has put a climate change doubter, Myron Ebell, in charge of his Environmental Protection Agency transition. Pamela Lestenkof, co-director of the St. Paul tribal government's Ecosystem Conservation Office, said strong southerly winds blew in for most of the fall, a big departure from the usual seasonal weather on the island. "We've had a lot of wind and high surf," she said. Only recently have winds shifted to the north, she said. "We're still seeing ones that are alive. They just stay put; they don't move. They look weak," she said. 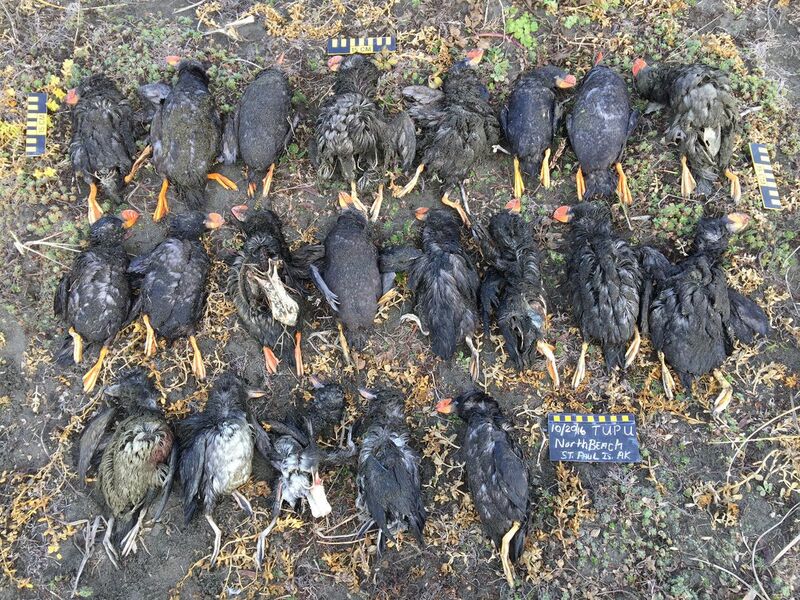 The tufted puffin die-off echoes other recent mass mortality events for Alaska marine animals. A die-off of common murres first reported last year is now classified as Alaska's biggest ever recorded for that species. Along with the beaches littered with dead murres, many of the birds have been found alive but starving and far away from their normal marine habitat, sometimes well inland. In the Gulf of Alaska, a die-off of large whales first discovered in May of 2015 has been classified by NOAA as an "unusual mortality event" warranting special investigation. Toxicity from harmful algal blooms — events associated with warm-water conditions — has emerged as a leading suspect in the whale deaths.